We are the student council and one of our jobs is to choose a charity to work with this year. Last Friday, we met with Maria Roche and she talked to us about homelessness. She works for a charity called Inner City Helping Homeless and this year they are running a shoebox appeal. She asked us to wrap and fill a shoebox with items such as shampoo and soap, deodorant and warm clothes. 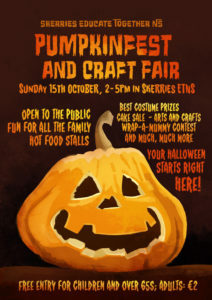 We discussed this and agreed to support the charity. 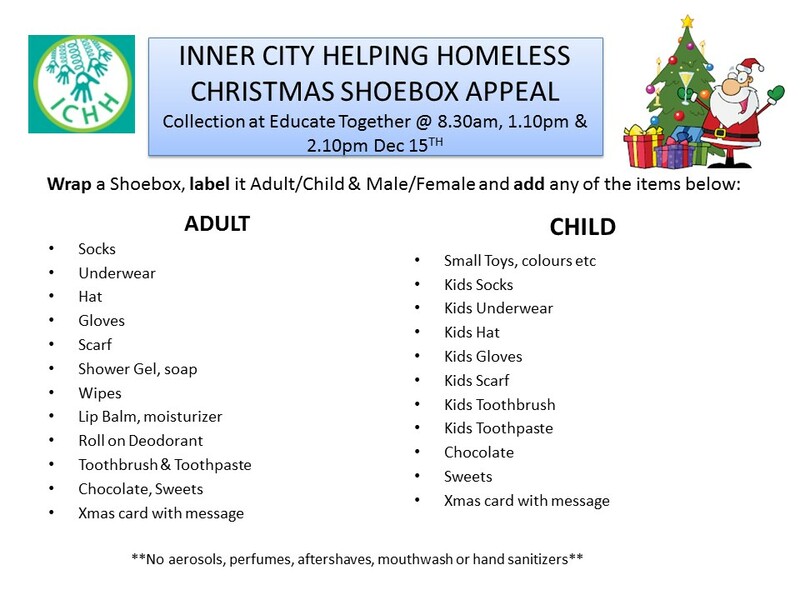 We are asking children in the school to bring in a shoebox on 8th December with some of these items. We will use the boxes to build a Christmas tree and then give the boxes to the charity. The student council spoke to children in school at a special assembly today to give them more details. This is voluntary and we hope that people would like to support this appeal. If you choose to support the charity, we would ask that you fill one shoebox per family only and bring it to school on the 8th. There are currently 8,374 people homeless in Ireland today including 3,124 children. 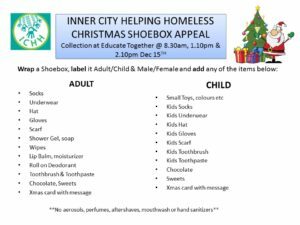 As Christmas is approaching we at Inner City Helping Homeless are launching an initiative to collect essential items for those who find themselves homeless this Christmas. We would like parents to consider getting their family involved to make up a Shoebox containing some of these items for the appeal. We are hoping to get one donation per family. ICHH will make sure that all donations received will be given as presents to Dublin’s homeless community this Christmas, not only rough sleepers but families in emergency accommodation, hostels and refuge centres. Parent Assembly Friday 10th November 2017. The next parent assembly is Friday 10th of November at 8.40am for junior infants to second class, parents will be admitted through the back doors for this assembly. Parent assembly for third to sixth class is 10.30am and we kindly ask parents to use the main reception door to enter for this assembly . 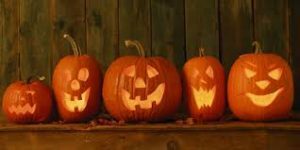 The school is closed for the mid-term break from Monday 30th October and re-opens on Monday 6th of November at 8.30am. 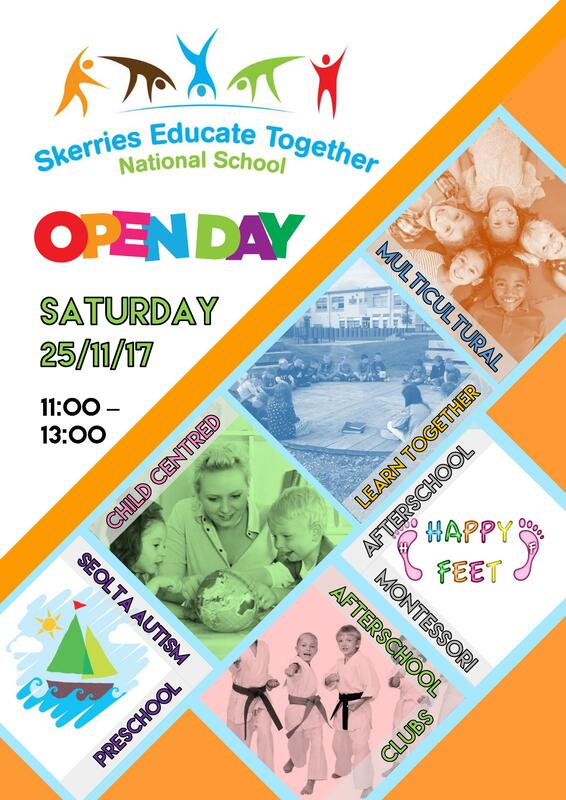 School closes at the normal times 1.10pm for junior and senior Infants and 2.10pm for first to sixth class tomorrow Friday 26th of November. Hope everyone enjoys the mid-term break. The Board of Management is currently looking at the situation with traffic, parking and safety of children in relation to this around the school and will address this situation more formally in the near future. I myself am becoming concerned about the number of cars that are entering the grounds. Some people are parking in the Seolta parking area at the side of the school. We have always asked parents not to drive into the grounds in order to keep all children safe. An exception is made for parents or children who have mobility issues and in this case a permit must be applied for at the office. Parking spaces are for staff only and we also need disabled spaces and the area outside Seolta Pre-school front door kept free and unobstructed for taxis and buses that deliver children to our Seolta ASD preschool. 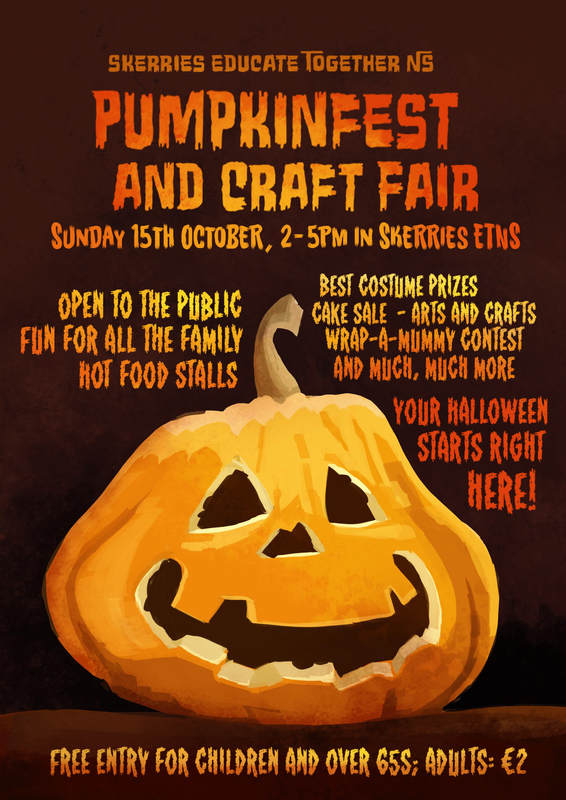 Parents are encouraged to park in the carpark across the road at Skerries Point Shopping Centre. My concern, and that of the Board of Management is for the safety of yours and every other child in the school. I respectfully ask that all parents heed this request and cooperate with not driving into school grounds. School Closure Wed 7th February 2018. I am writing to inform all parents of some staff training that needs to take place in the near future resulting in a one-day closure on Wednesday 7th February 2018. Maths week starts next Monday 16th October and we have a range of interesting activities in the school. Some classes are doing projects on Money and Finance during the week and all classes will be learning strategy games and maths games with playing cards. A big thank you to the PTA for funding decks of cards for every class! Some classes need helpers during maths week. Please check the timetable below, to see if help is needed in your child’s class and write a note in your child’s homework journal stating the date and time you are available. 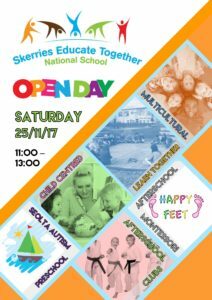 Jnr infant parents can send in a note with your child, stating the date and time you can come in. The teacher will get back to you confirming the date and time. If you can help, please write your note in the homework journal before Thursday 12th October. Instructions on how to play the games will be emailed home on Friday. Sinead Tuesday 17th 11.00 for 20 mins. Wed. 18th 11.00 for 20 mins. Thursday 19th 11.00 for 20 mins.. 2 parents for each session. Dee Tuesday 17th 1.30 for 30 mins. Audrey Tuesday 17th 1.30 for 30 mins. Wednesday 18th 1.30 for 30 mins. Sylvia Tuesday 17th 1.30 for 30 mins. Ciara 6th class Tuesday 17th 1.30 for 30 mins. Please see below dates for Parent Assemblies for the year ahead.